Monkey Business Agency Customer Guide | My Account - Login to manage your Project Plans / Quotes, Projects, Domain Names and more. With My Account, you have round the clock access to manage your business with AJIBOYE Monkey Business Agency. 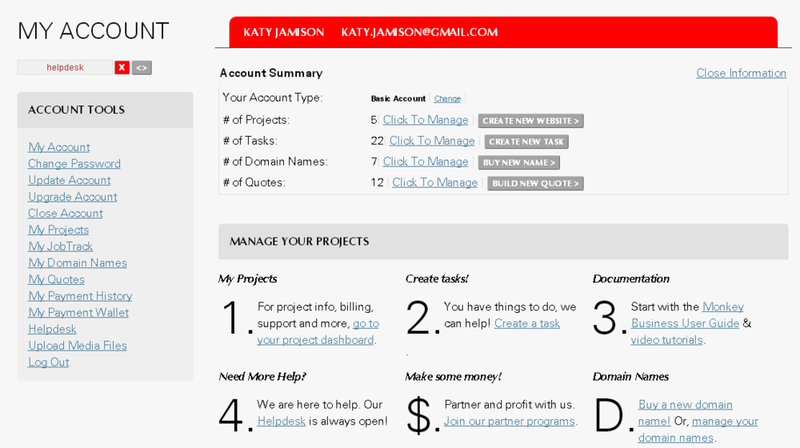 Login to access your Project Plans / Quotes, Projects / Websites, Domain Names, and more. Your AJIBOYE account provides secure and 24x7 access to your information, products and services. You will need your account email address and password to login. Your account email address is the email address you provided at the time you created your AJIBOYE account. Your account password is the password you choose at the time you created your AJIBOYE account. Recovering your account email address. If you forgot your account email address, try logging in with the email address that you receive messages from us. If that do not work, your only option is to contact Helpdesk for help. If you know your account email address, but forgot your account password, you can recover it using Password Recovery and a new password will be emailed to you in minutes. Password recovery option is available on our Login pages / forms. Simply locate and click on My Account ( found in the Shortcuts menu & Sitemap ). Upon login you will have something like this.